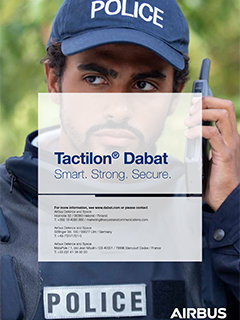 Tactilon Dabat is the world’s first smartphone and full TETRA radio in one device. Smart, strong and secure device for public safety. It will help organisations to save time, money and resources - and lives. TETRA and LTE are available in one device. A new way of communicating with a dual-mode device (DMD) enables new efficient ways to work. Use it as a TETRA radio for critical communications. Use it as a smartphone for mobile applications and special public safety apps It has Android features and special design for radio use. It is a smart, strong and secure device for public safety. Tactilon Dabat won the category of "Best evolution to future broadband" in the International Critical Communications Awards 2018. The awards have been designed to recognize excellence in the field of mission-critical radio communications. 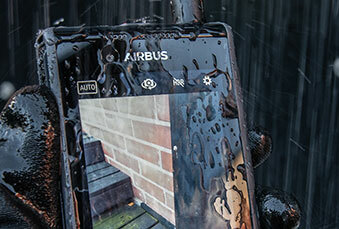 The jury, which included 11 judges from around the globe, identified Airbus’ Tactilon Dabat solution as the forerunner in the dual use of both TETRA and broadband. Winning the Intersec Award 2018 in the category of “Innovative Security Product of the Year” is yet another proof of the excellence of Tactilon Dabat. See the press release "Tactilon Dabat won the Intersec 2018 Award"
Why combine a TETRA radio and smartphone? We’ve all grown used to smartphones in our private lives – and police officers in countries such as Finland, France, Sweden, Switzerland, United Arab Emirates and the UK are already using smartphones in their work. They are taking advantage of broadband and high-resolution video. This has the obvious drawback of each officer carrying two devices or more and all the management headaches that creates. The smartest R&D people took a new look at the two devices challenge. Their solution was to bring full TETRA radio functionality into a smartphone that is specially designed for professional, every day, all-the-time use. Tactilon Dabat rewrites the rules of what a professional mobile device should be. It is optimised for speech, not music as are many smartphones. It cuts background noise that many professional users struggle with. It also has extended battery life, twice that of a standard smartphone. All the communication tools you need – in one device. Your team has advanced applications, built-in security and broadband data at their fingertips. Identity checking complete with database lookup, map apps, messaging AND secure group communication. See the Tactilon Dabat presentation video by Mika Myllymäki from Airbus. Tactilon Dabat is the world’s first smartphone and full TETRA radio in one device. It is a smart, strong and secure device for public safety and mission critical users. Catalin Gheorghiu from Airbus gives three expert tips for those who need to use both TETRA and LTE for their communications. When every second counts - Tactilon Dabat in action. See how Tactilon Dabat enables professionals to perform at their very best. This device is your choice for working in a hybrid TETRA and LTE environment. Get all details of this exciting product - download its technical specification.